We have presented a variety of data below to help our readers understand how many US soldiers, Iraqi troops and civilians, and coalition forces have died in Iraq since the beginning of the war in Mar. 2003. The range of deaths in the Iraq War has been estimated at between 56,027 and 654,965. The source for each set of information appears underneath each respective chart or graph. This information has been difficult to find because most available statistics are not comprehensive and often have differing time ranges, data sets, geographic coverage, definitions, and interests to serve. For example, the US Department of Defense (DoD) has not released numerical values for the number of Iraqi civilian deaths although they have plotted deaths along a line graph giving ballpark mortality estimations. Also, the Iraqi government banned the release of civilian casualty data as of Feb. 2007 which the United Nations had previously used in compiling its statistics on Iraqi civilian mortality. III. US Military Fatalities by Gender, Age, Race, etc. I. Cumulative US Military Fatalities, Mar. 1, 2003 - Aug. 5, 2009 - This graph represents the increasing total of US troop deaths in Iraq from the start of the conflict in March 2003 through August 5, 2009. II. 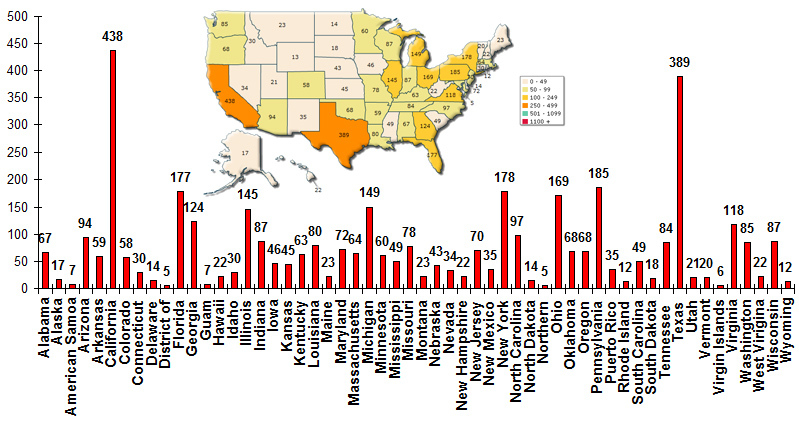 US Military Fatalities by State- This graph shows the state of residence of US troops who died in Iraq from the start of the conflict in March 2003 through May 22, 2008. There were 4,079 total US military fatalities. III. US Military Fatalities by Gender, Age, Race, etc.- This chart breaks down US military fatalities in Iraq by gender, status, age, type of duty, and race/ethnicity for all fatalities between March 19, 2003 and May 3, 2008. IV. 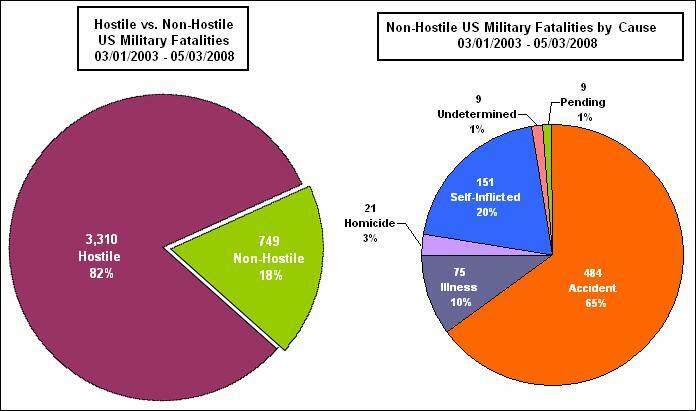 Hostile vs. Non-Hostile US Military Fatalities - These graphs represent the number and percentage of hostile (3,310) versus non-hostile (749) US military fatalities in Iraq from March 19, 2003 through May 3, 2008. V. Coalition Troop Fatalities by Country- These graphs represent the number of coalition troop fatalities by country from the start of the conflict in March 2003 through April 24, 2008. There were a total of 4,049 US and 310 coalition fatalities from other countries. Notes: Many of the 20 coalition members do not clearly show on this graph because they represent a relatively small portion of the overall coalition troop fatalities. VI. Average Number of Iraqi Deaths per Day*- This graph compares the four out of nine studies from our Casualty Studies Chart that have comparable data for Iraqi civilian and military/police deaths. It has been updated to reflect new data from the Brookings Institution and iCasualties' most recent reports, but because of a ban established by the Iraq government in Feb. 2007 prohibiting the release of civilian casualty data, the UN Assistance Mission for Iraq (UNAMI) civilian mortality estimates have not been updated as of June, 11, 2008. The UNAMI report was revised from 102 to 104 average daily Iraqi deaths based on a prior miscalculation. Additionally, as of June 11, 2008 an update of the Johns Hopkins University/Al Mustansiriya University study is not available. *ProCon.org generated the daily death averages above by dividing each study's total number of deaths by the number of days covered in the study. Where the time span for Iraqi civilians and Iraqi military differed within the same study, we extrapolated the average of the smaller time span to equal the number of days in the larger time span. The time span covered in each report varies, and although some periods of the war had higher casualty rates than others, this graph does not account for those temporal fluctuations. VII. 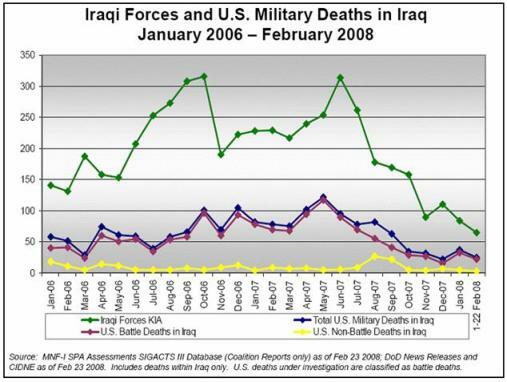 Iraqi Forces and US Military Deaths in Iraq, Department of Defense Report- This graph is a duplication of the Department of Defense's "Iraqi Forces and US Military Deaths in Iraq January 2006 - February 2006" chart which displays US and Iraqi troop deaths by month. As a result, the formatting is slightly different than our other presentations. Notes: The Department of Defense has not released numerical values for points within this graph as of June 9, 2008. VIII. 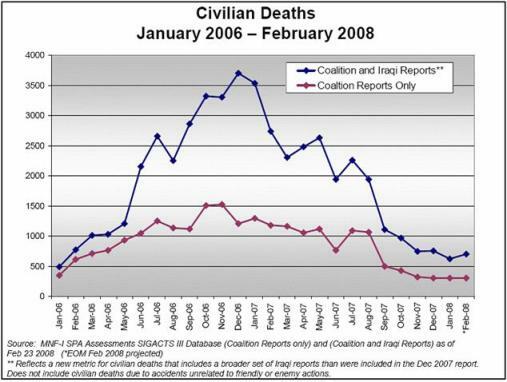 Iraqi Civilian Casualties, Department of Defense Report- This graph is a duplication of the Department of Defense's "Civilian Deaths January 2006 - February 2008" chart which displays Iraqi civilian deaths by month. As a result, the formatting is slightly different than our other presentations. Notes: The Department of Defense has not released numerical values for Iraqi civilian fatalities as of June 9, 2008. IX. Average Daily Casualties by Time Period- A US Department of Defense graph of the average deaths per day of Iraqi civilians, Iraqi security forces, and coalition troops during significant periods in Iraq from April 1, 2004 to May 4, 2007. This chart has not been updated to reflect new data because the Department of Defense has not updated this chart published in June 2007 as of June 10, 2008. Notes: Casualty data reflect updated data for each period and are derived from unverified initial reports submitted by Coalition elements responding to an incident; the inconclusivitiy of these numbers constrains them to be used only for comparative purposes. Operation FAQ: Operation Fardh al-Qanoon; translates as "Enforcing the Law." X. Chart Comparing Ten Casualty Studies- This chart compares the total death count from ten casualty studies of the Iraq War. We have listed the deaths of Iraqi civilian, Iraqi military/police, U.S. military, and coalition military forces whenever that information was available. The studies cover differing time periods and population groups and use a variety of methodologies. Note: No update is available for this study as of May, 20 2008.